Bone-in, skinned chicken thighs provide plenty of flavor for this slow cooker pulled chicken. Great on sandwiches, as a pizza topper, or stuffed in a taco or burrito. Shown here with a side of Red Slaw and Sweet Potato Fries. 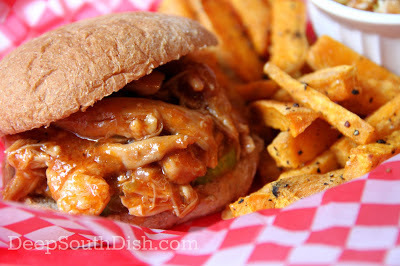 I love slow cooker "pulled chicken" because of its versatility. Not only is it good piled on rolls and buns, but its great rolled up in tortillas, stuffed into taquitos, tacos or burritos, or if you're trying to reduce carbs a bit, piled up in lettuce cups and topped with coleslaw or for barbecue pizza. It's also okay to use a mix of chicken here, including those infamously every-popular boneless, skinless chicken breasts, though I personally prefer to use bone-in chicken and most often, chicken thighs because those are the most flavorful to me. Mixed pieces also work very well. It takes literally seconds to pull the skin off and once it stews, removing the meat from the bone is super easy too. Kitchen Bouquet and Colgin brand Liquid Smoke are both pantry staples here in my kitchen, and really, in this part of The Deep South for those folks who still do a lot of scratch cooking. I use one or both of them regularly in many of my sauces. Kitchen Bouquet is a browning and seasoning sauce made from caramelized vegetables and it's used to enhance sauces and gravies. Liquid Smoke, which is like a liquid form of condensed smoke, adds a smokey flavor to the sauce. Each add their own elements of flavor, but if they aren't something you keep on hand or can't find, simply omit the two. Of course, the fastest and easiest method for a pulled chicken is to buy a rotisserie chicken and a bottle of your favorite barbecue sauce, but I hope that you'll give this homemade version a try sometime. The sauce is really no trouble, and the slow cooker does all of the work. Here's how to make it. 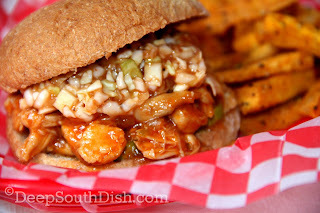 Pulled chicken topped with red barbecue slaw. Visit my Pinterest page for more of my favorite slow cooker recipes! Whisk together the sauce ingredients; set aside. Season the chicken to taste on both sides. Heat oil and brown chicken, turning once to brown both sides. Remove and set aside. Melt butter into the drippings, add the onion, jalapeno and garlic, cook and stir until slightly cooked and softened. Add the sauce to the vegetables. Add the chicken and any accumulated juices to the slow cooker and pour the sauce on top. Cover and cook on low for about 5 hours or until cooked through and meat easily shreds from the bone. Remove chicken and once cooled enough to handle, remove bones and shred. Bring sauce up to a boil and combine the cornstarch with a splash of water to make a slurry. Stir the slurry into the boiling sauce and let boil for 3 minutes, stirring a few times. Return the chicken to the sauce, toss to coat and turn off cooker. Taste and add salt and pepper, only as needed. Cook's Notes: Serve chicken on buns or rolls, topped with a vinegar coleslaw, if desired, use in tacos and burritos, or serve in lettuce cups. For a great burrito, combine pulled chicken with leftover Mexican or Spanish rice, seasoned black beans and cheese; roll in flour tortillas. For taquitos, roll chicken in softened corn tortillas, secure with wooden picks and deep fry. Platter, top with finely shredded lettuce, cheese and salsa. Coke Chicken: Substitute Coca-Cola Classic for the chicken broth. BBQ Ranch Chicken: Add in one packet of dry Ranch salad dressing and seasoning mix. Red Barbecue Slaw: Adapt your regular vinegar slaw by adding barbecue sauce or ketchup, to taste, and a few dashes of hot sauce and/or dried red pepper flakes. I just love that expression Larry! aha! I knew I would come across a good recipe for chicken thighs. I know a lot of folks like to use boneless skinless breast but those bone-in thighs are just so much more flavorful. Enjoy Laurie! We try to always have vac seal bags of pulled chicken and smoked pork on hand in the freezer, it is so convenient and only takes minutes to thaw. PS - I love that you love chicken thighs! They are my favorite part of the chicken. BF is a snob and insists on boneless, skinless chicken breasts...it's like he doesn't even realize how much flavor he is missing out on! I would agree on that LS & KB myself & on the chicken thighs too!! Just what I was looking for to put on my homemade slider buns! And I love the rest of your blog--I'll be back to try some of the other recipes too. On a side note, I think it's interesting that even though you are all about Southern recipes, many of what I've seen is what I remember about my childhood in Pennsylvania Amish country! Really? Well, I don't know much about that area or their cooking but in truth, I think we all cook very similarly across this country anyway, so I wouldn't be too surprised! This looks amazing! I will make this on Sunday! I made your Dr. Pepper pulled pork and it was awesome! Thanks so much Maegan & I hope that you enjoy this pulled chicken too!! Mary, these sounds good....and I also vote for bone in thighs!! gotta try this weekend ...bookmarked!! I hope your family enjoys it!! Mary- i found this recipie last week and made it for my family at a barbece........it was a tremendous success and all thought it was simply delicious. since then i havent stopped trying to re-create these recipies and bring the taste of the deep south to all my family and friends in Liverpool, England! thank you so much and please keep em coming! Oh my goodness! That is so exciting to me!! Please tell everybody I said 'hey y'all!" Mary, though I’m not really a big fan of pulled chicken, this looks really, really good. I like the idea of chili sauce and your variations as well. I will definitely give this a go. I perfected something similar about 3 years ago. I brown a doz. bone-in, skin-on thighs in Crisco and butter. Then it goes weird from there. I add a pint of peach preserves, 1-1/2 c. of Sweet Baby Ray’s BBQ sauce, then a pint of Jack Daniels; save but a for a wee touch of the creature for the chef. Whatever chicken is leftover is skinned, deboned and shredded. For the next go-round, the remains are thrown into the crock pot, with the sauce, and allowed to infuse for hours on low. Put that on a homemade brioche bun, with plenty of sauce; it’s epic. Thanks again. Doesn't seem weird to me at all Chris, sounds good! My crock pot is with a family member but Im thinking I could just put those pieces in my cast iron frying pan, cover it and slow cook it in the oven. I have a big 12 inch so im thinking it should work. Ive really not been in the mood for cooking anything and eating it too but this looks really good. Absolutely! Just use a low heat, like 325 maybe, tightly cover with foil and check it around 2 hours to see if it's tender enough for shredding.